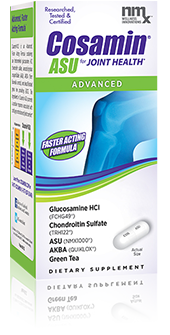 Cosamin ASU is the only retail joint supplement that contains our trademarked glucosamine/chondroitin/ASU (Avocado Soybean Unsaponifiables) combination on the market today. This patented combination of ingredients results in our most complete formula to help promote joint comfort. 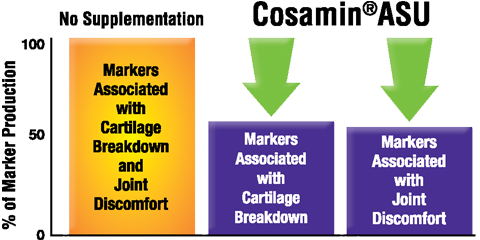 The combination of active ingredients in Cosamin ASU have been shown in laboratory cell culture studies to inhibit the expression of markers associated with cartilage breakdown. In addition, AKBA, from Boswellia serrata, is an ingredient scientifically researched to be faster acting than glucosamine alone. ASU stands for “Avocado Soybean Unsaponifiables” and is an ingredient used in premium supplements to promote joint comfort. ASU is an ingredient derived from the oils of avocados and soybeans which has been shown in published laboratory research to inhibit the production of substances produced in the body which are associated with cartilage breakdown and joint discomfort. Plant oils, such as those from avocados and soybeans, contain large amounts of fatty acids along with other compounds. Saponifiable oils, when mixed with lye, form the basis of numerous soap products. Unsaponifiables are the oil fractions that cannot form soap, but have positive health benefits when consumed by mouth. The unsaponifible fraction of avocado and soybean oils contain compounds, that after being separated out and concentrated, have been found to produce positive joint health benefits when consumed orally. What is AKBA and Why Is It Important? AKBA (3-acetyl-11-keto-beta-boswellic acid) is an herbal extract of Boswellia serrata. There are several boswellic acids, but AKBA is considered the most beneficial for joint health. AKBA, in combination with glucosamine, chondroitin, ASU, and decaffeinated green tea extract providing EGCG helps promote joint comfort. AKBA has been scientifically researched to be faster acting than glucosamine alone. Who should take Cosamin ASU? 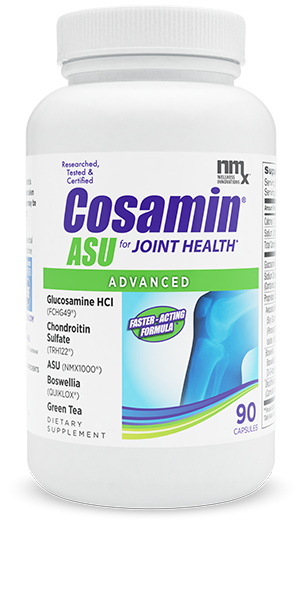 Cosamin ASU is for anyone experiencing joint discomfort and looking for a more complete joint health supplement. Cosamin ASU is also an ideal product for those people who have tried other joint health supplements (glucosamine, chondroitin, MSM, UC-II, etc.) without success. 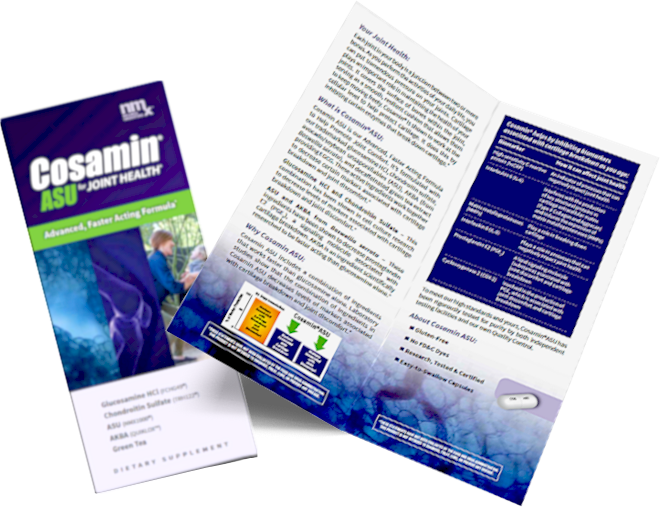 Cosamin ASU is available in easy to swallow capsules and can be purchased at pharmacies nationwide. Hear Track and Field Legend (and 5 Time World Record Holder) Jim Ryun’s Success with our Advanced, Faster Acting Cosamin ASU! 1 “Leading Joint Supplement" includes top 10 brands based in part on data reported by Nielsen through its AOD Service for the Supplement Category for the 52-week period ending 5/20/17, for the U.S. market. Copyright (c) 2017 Nielsen.